NEW ALEXANDRIA, Pa. - Mitch Shomber had a near perfect run to edge Steve Marinchek for the victory in Sunday's International Hot Rod Association (IHRA) Summit Sportsman Spectacular race at Keystone Raceway Park. 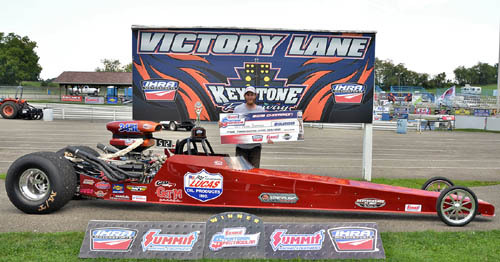 Shomber from Philo, Ohio had a perfect light (.000) and then paired it with a 5.129 elapsed time at 131.27 mph against a 5.12 dial-in in the final of the $5,000-to-win race. Marinchek from Mt. Pleasant, Pa., was solid with a .015 reaction time, and then posted a 5.009 elapsed time at 136.99 mph against a 5.01 dial-in. The final margin of victory was a scant .004 of a second. JT Harrold from Pittsburgh was the final No Box racer. He had a .021 reaction time and then matched his dial-in with a 6.531 elapsed time at 103.85 mph. Hometown driver Kevin Romeo from New Alexandria, Pa., went 6.762 against a 6.75 dial-in and had a .028 reaction time. Ava Hamilton was the winner for the Junior Dragster 7-11 category. The Dresden, Ohio driver was ..019 at the tree and then ran a 9.002 elasped time with a 8.99 dial-in. Isabella Richey from Ebensburg, Pa., was the runner-up with a .100 reaction time and running a 9.052 against a 9.02 dial-in. In the Junior Dragster 12-17 race, Kyle Beno from LaGrange, Ohio, picked up the win by going 7.943 against a 7.94 dial-in with a .054 reaction time. Runner-up Eddie Yorns III from New Brighton, Pa., had a .062 reaction time and went 7.944 against a 7.95 dial-in for his final-round run.